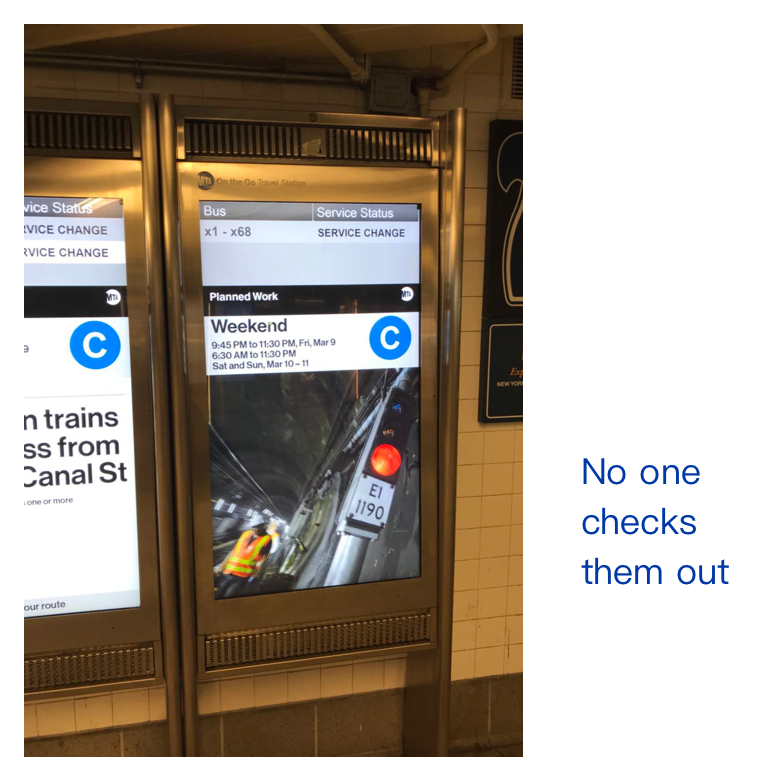 Have you ever had that experience — running rush in a morning to catch a early class or try to go to work in time, but you found out you had insufficient fare in your metro-card. Then, you got in line for a MTA machine to refill it. However, the process of refilling a metro-card just got out off your control and expectation — coffee splited, important files lost, the guy in front of you just had no idea of what he was doing(wasting so much time on simple tasks), and you didn’t catch up the right train starting in 2 min. Without a question you got late in the end. What a “wonderful” start of your day! 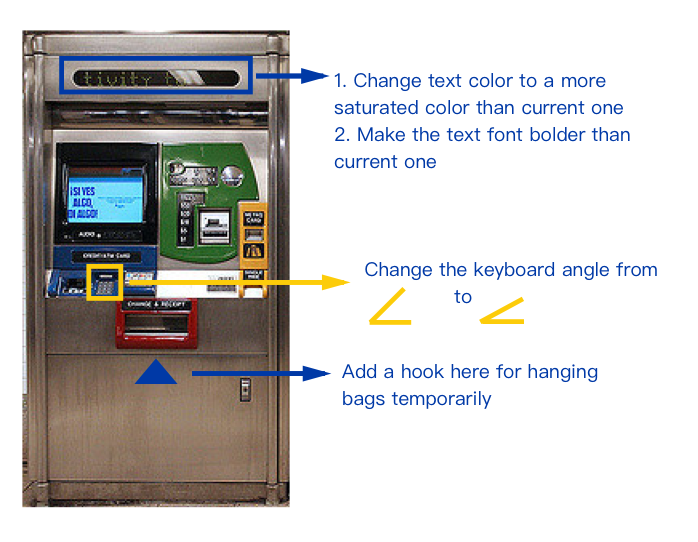 A redesign of MTA vending machines is needed and will be introduced as below. 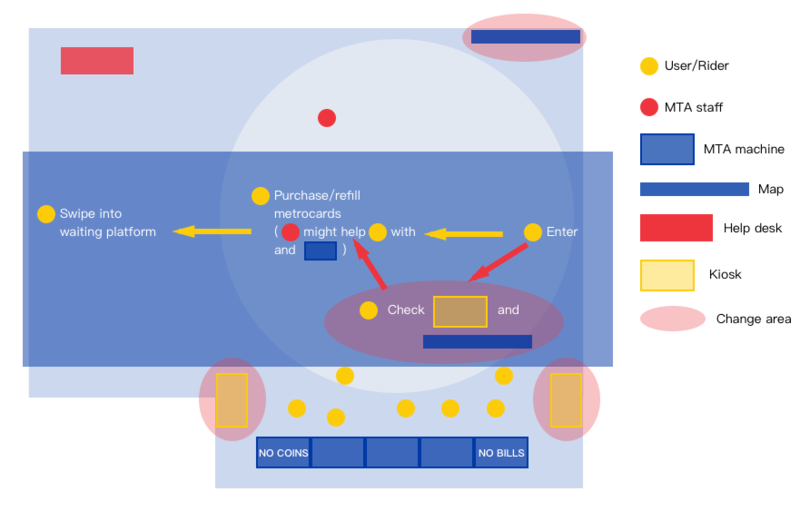 What do subway riders suffer when operating on the MTA machine? 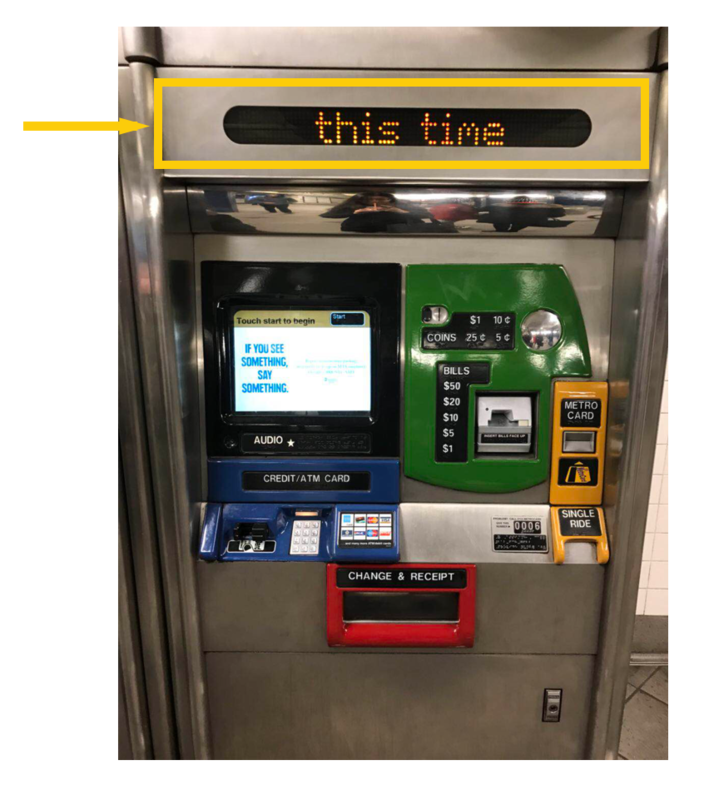 There were total 94 users using MTA machines during 30 min, and on average, every user spent 96 second to finish to whole process. 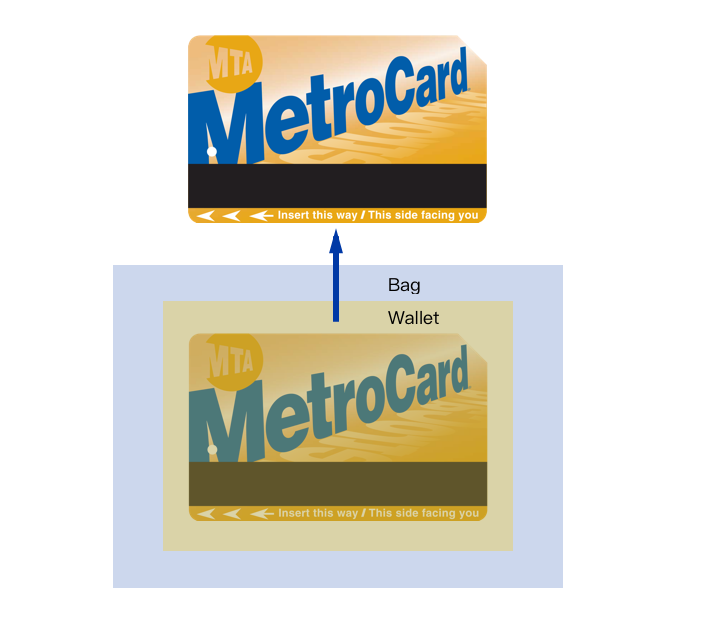 If any user needed to take his or her metro card from his or her bag, it normally took over 15s. There were several lost metrocards on the floor. 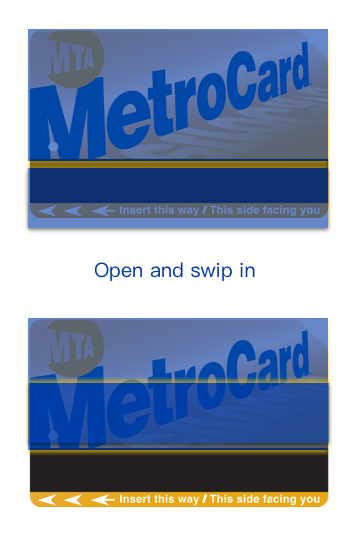 not easy to keep in hand (It needs a container — normally it is used as How to take a metro card. Therefore, it takes time to withdraw it). They would just put their personal belongings on the dirty floor during the time of operating on the machine, which is neither safe nor clean. Or holding their drinks in weird and uncomfortable position, which makes the purchasing process difficult. There is no extra and clean space for them to put their redundant but important stuff (such as files) temporarily. In order to finish the whole purchasing, at some point(when finding their purse in the bag), users need to operate with two hands. 2 people changed machines because they didn’t see no bills or no coins sign on the screen. When using the machine, the sign shows way more above human’s eyesight, and the content in the sign is not that recognizable from 12 feet away, which means when users walk to a waiting line, they might not be able to know the a machine does not accept bills or coins. 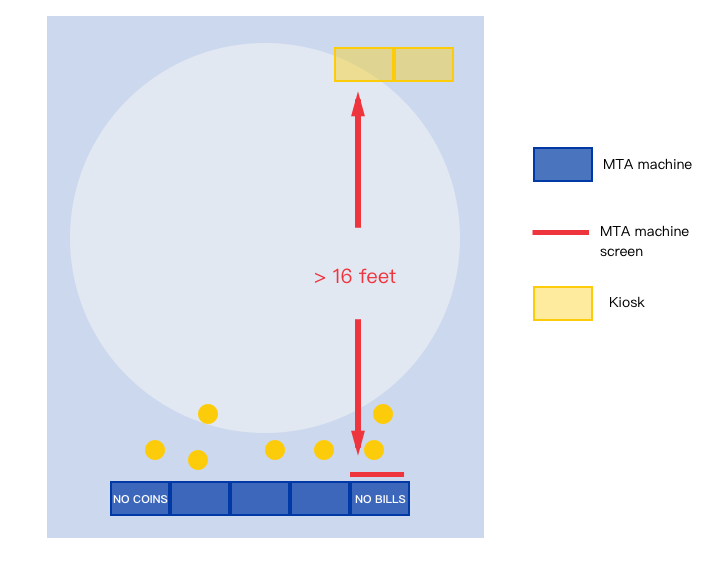 “No coins or bills” is showed on the fourth screen when operating on the machine, which leads to taking more time to know the information. 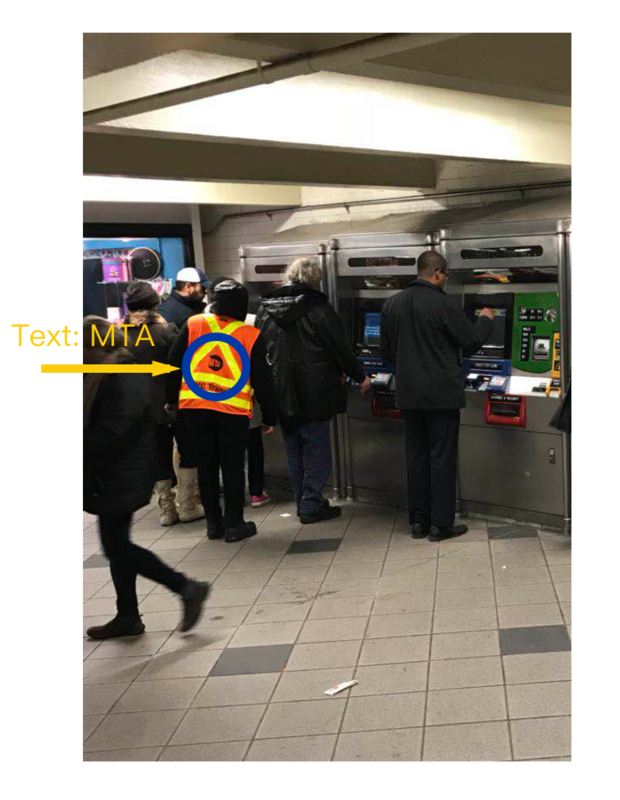 MTA Staff came to help users 3 times during half hour. On average, it took her 2 min to help a user. Users didn’t initiative any needed help. The staff initiated all the 3 favors. Color of her uniform is good, but the text is too small and the color is not so visible. There is not indication around and on the machine screen shows users can seek for help. It takes around 12 screens to complete a purchase. Users didn’t choose language other than english. Only 2 people used cash to purchase. Only 6 people took their receipts, three of them threw receipts on the floor. Most people in the city have the ability to understand basic English. 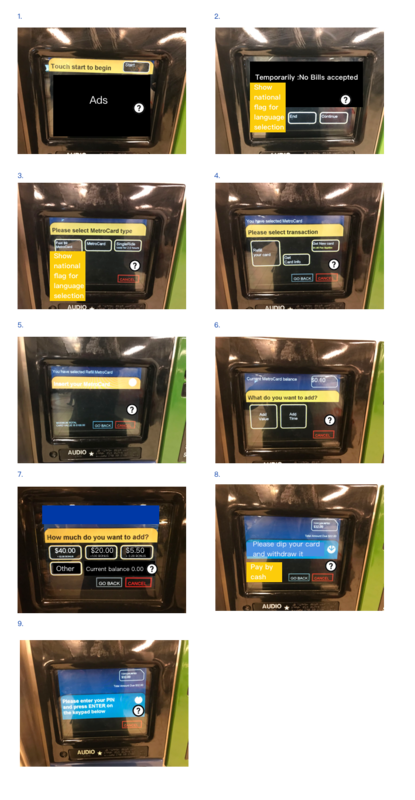 The sequence of screens increases the purchase time (i.e. Choosing language and choosing payment method). Start screen content is redundant (but might be useful for ads). Users had problem on paying (dipping in the card with 3 seconds pause). They didn't know they need to withdraw the card first, then entering the pin number. Therefore, some of them dipped cards twice. 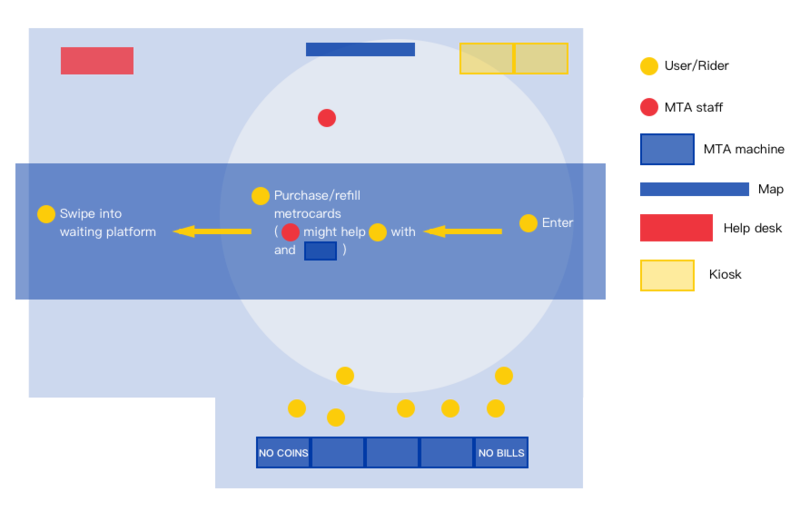 It is easy to see how much money do users left in their metro card on the screen (from my observation point, which is roughly 10 feet from those machines). 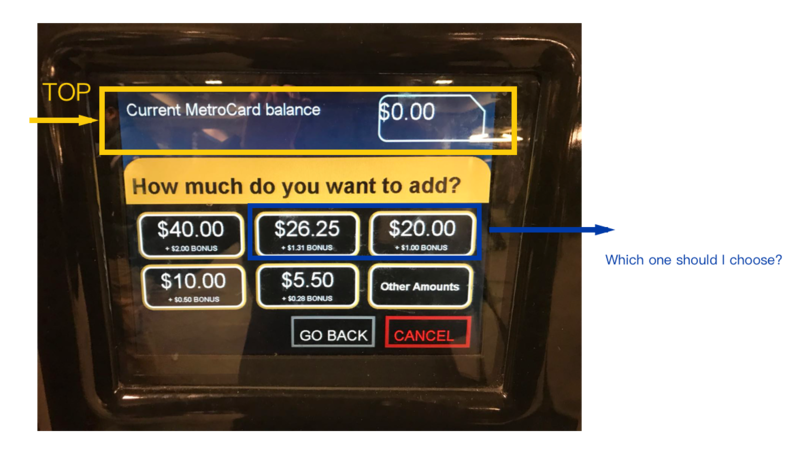 Users felt hesitated (spent roughly 2 seconds) when choosing what dollar amount they are going to refill to metrocards (there are 6 options). 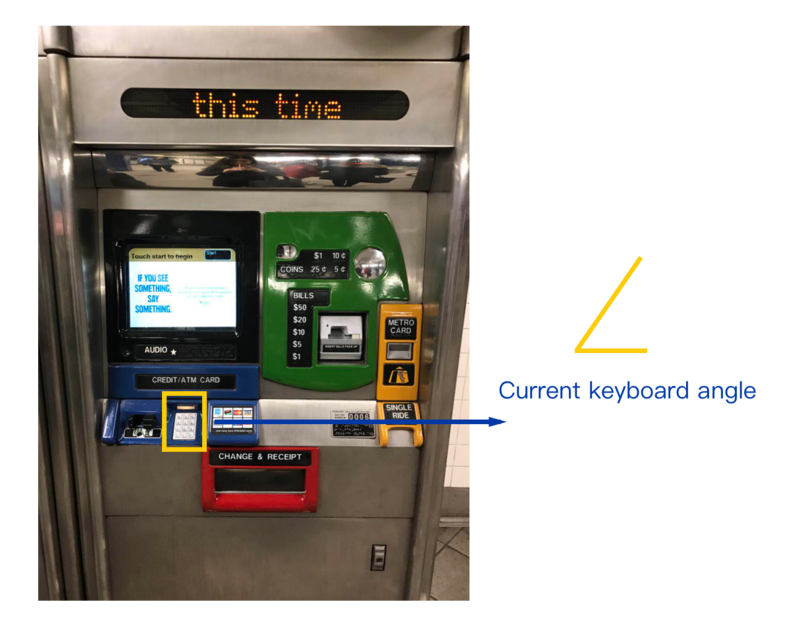 There is no feedback on the screen after inserting card for users and instruction text is not clear. The arrangement of contents in the screen is not appropriate or reasonable. i. It shows dollar amount at very top of the screen. ii. It has too many options for users to choose dollar mount (There are 6 options; however, it doesn't make too much difference when choosing one instead of another among some options. i.e. comparing choosing between $20 and $26.25 with choosing between $40 and $5.50). iii. The bonus info can be confused. If the waiting line is not too crowded, it is easy to see a guy entering his pin number (From my observation point, which is roughly 10 feet from those machines). Position and angle of keyboard is not appropriate. 2 kiosks are too far away from MTA machines. When users are operating on the machine, they are turning back to these 2 kiosks. After ideation and synthesizing solutions, they will be introduced in three parts. Other elements can be arranged or changed to make the purchasing experience more user-friendly than current ones. Proposing solutions all align to the principle of using the least cost to maximize users’ benefits. Due to arithmetic progression, every user spends 9.67s on operating on the screen, which means it takes 0.8s to operate on each screen(go through 12 screen on average). With modification as above, ideally, it can save 2 screens of operating time which is 1.6s, then the waiting time will be shorten as well. All numbers mentioned above can be more accurate if having more data. 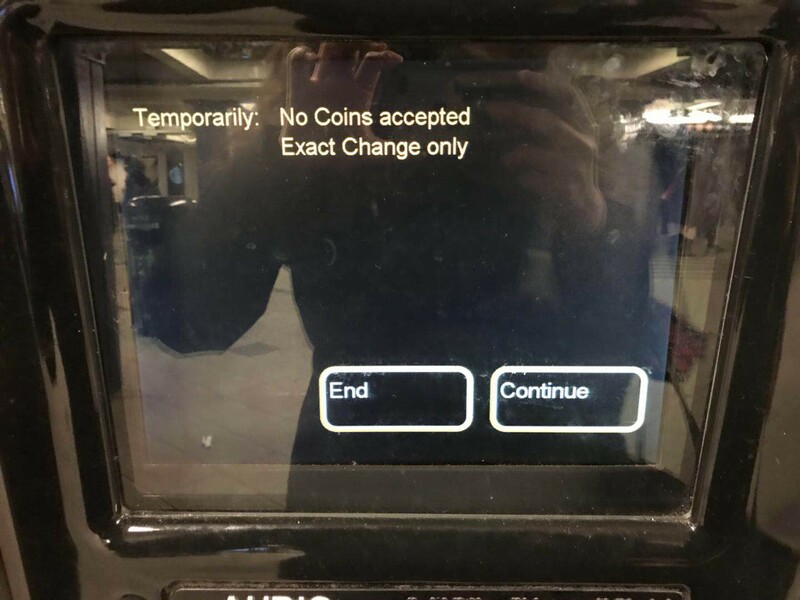 Showing ‘no coins’ or ‘no bill’ message from the fourth screen to the second screen, if that vending machine doesn’t accept coins or bills temporarily. Setting a help button on each screen(show as ‘? icon’ as above in each screen), where the staff can receive the help signal from any user once a taping it. Delete current choosing language screen, and start the screen content in English(default). And set a button(show as national flag) by the left side of the second screen for choosing other language. Delete current choosing payment screen, and set card as default payment method to let users directly dip their card. And set an button by the left side of the eighth screen for choosing cash. Modify the instructions text on eighth screen from ‘dip your card’ to ‘dip your card and withdraw it’ or add feedback text ‘withdraw you card and enter pin’ after users dip their bank card. Move current balance info to the bottom of seventh screen. Desgining a metracard case to make the total card thicker than current one(like the thickness of a bank card), therefore it would be harder to lose it on the floor. When design is focusing on usability, it is all about detail. Wish you all have good time when traveling in NYC.